I have wanted this hand cream for absolutely ages. To be quite honest with you guys, I think the only reason why I wanted to try this Aesop Hand Balm is because of how stunning the packaging is and how pretty it looks. I seem to see this cream in so many Instagram posts and blogger flat lays, so I think that initially drew me towards it. I have been trying to branch out and try new brand and not just that, I want to try and up my photography game, so I thought that this would make such a great prop. Only when I received this, did I realise quite how lovely this product is and now I cannot stop using it. I am one of them people that everybody knows has a hand lotion in their bag. Like when you were at school and there was always that kid with the chewing gums, well I am that girl but with hand cream. I honestly think there is nothing worse than dry hands, it just makes me feel disgusting. If I get dry hands, which I tend to get in the colder winter months and I rub them together, it actually makes me feel physically sick because of the texture of them. Which is why I normally keep them lotioned up to within an inch of their life, which tends to result in hell of a lot of dropped phones! 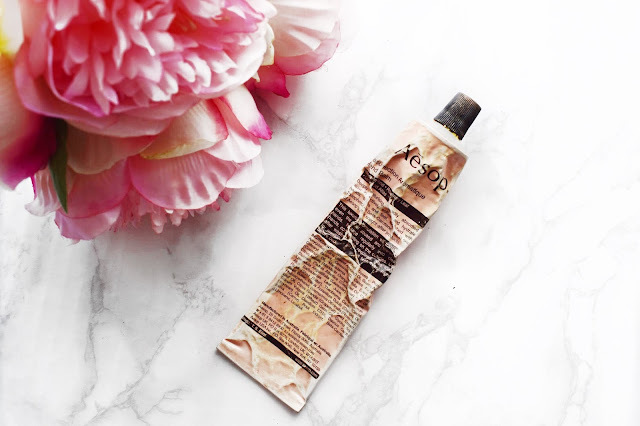 For me, I have never really been bothered about which hand creams I carry in my handbag, so I usually just carry one of the Soap and Glory hand creams with me, because I have them in abundance from Christmas gift sets. My only issue with the Soap and Glory hand creams is the smell of them. They are all very sweet smelling and it can be a little too intense for me, especially if I am applying it a couple of times throughout the day. 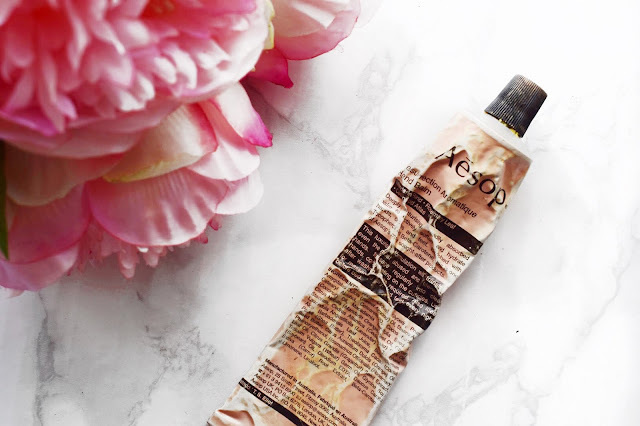 So, I wanted something that was a little more grown up smelling and that is another reason why I went for this Aesop Hand Balm. So, I thought it was time to finally mix things up and I finally went ahead and bought this Aesop Hand Balm. It wasn’t until I was browsing the Space NK website that I finally decided just to bite the bullet and go ahead and buy this. I actually initially logged onto the Space NK website to browse the sale, but as normal I was tempted by the full price items and before I knew it I was putting in a haul worth over £500 and this hand cream was part of the incredibly expensive haul. I had read a lot about this hand balm before I went ahead and purchased it and I decided on this one because everybody had said how beautiful it smells. I could not disagree that the first thing I noticed was just how stunning the scent of this was. But, I have to admit that the scent is very intense. If I take this from my handbag and apply it there are people in the same office as me but at the other side of the room that can smell it and they know that I am applying my hand cream. I also find that the scent of this kind of divides opinion. Some people like myself, seem to really love it, but others dislike it and think that it smells like Vick Vaporub! To be quite honest, I’m not in the slightest bothered about what others think because I adore the scent of this. Plus, the most important factor about this hand cream is how it soothes and makes my hands feel and I have to admit that it makes my hands feel like pure velvet. With just a small amount of this, my hands are as good as new, and they are lovely and smooth again. I feel like it soaks straight into the skin and doesn’t leave me with any sticky residue, which is perfect for when I am at work or at home working on my laptop. I honestly love this Aesop lotion so much. I make everybody try it out because it works so well. I don’t normally do posts like this about lotions and skin care really, but I absolutely rave about this product, so I thought that it was well deserved of a full post to itself. The best thing about this Aesop Hand Lotion is that it also comes in a much larger bottle with a pump on the top which is perfect for sitting on my desk at work and at home. It is just so handy because I constantly moisturise my hands when I am working from touching paper constantly. I will leave a link to this down below in case you want to check it out for yourself. Make sure to leave me a comment and let me know if you have tried this and what you thought about it! It is lovely, when I use this at work people across the room can smell it! It is so lovely, honestly the nicest hand cream that I've used!